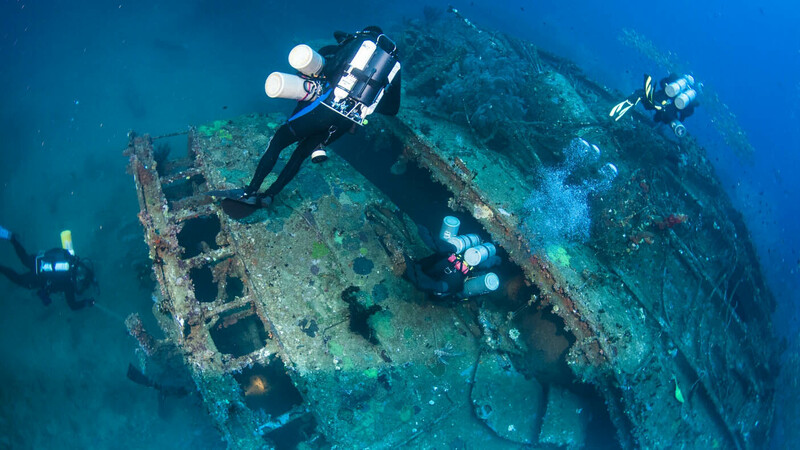 The ultimate wreck dive of the world! Absolute adventure TEC and CCR playground! 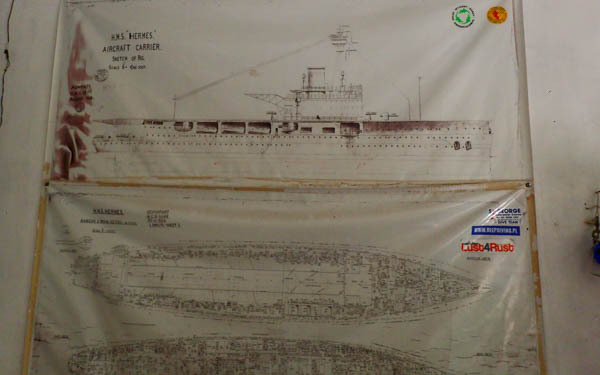 Feli Fernando considers his finding of the location of the world’s first purpose-built air craft carrier which was lost for more than 3 decades due to fishing restrictions and the unrest which was sunk by the Japanese during the 2nd World War off the east coast of Sri Lanka, as the highlight of his career. 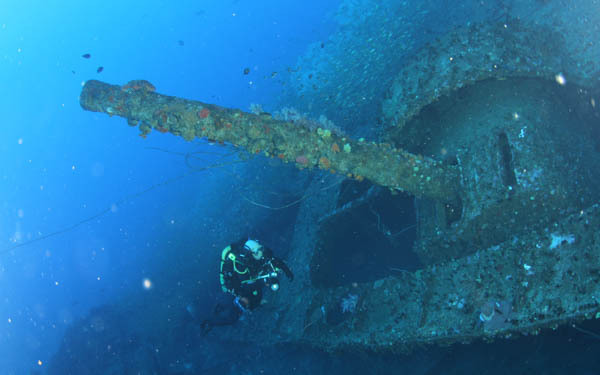 According to Feli, diving to the Hermes is the ultimate wreck dive and the minimum requirement is TEC 45 As the wreck rests at a depth of 53 m. With Feli’s technical competence, vast experience and intimate knowledge of this spectacular dive site an unforgettable tour of the Hermes can be guaranteed. Feli manages Sri Lanka Diving Tour’s well equipped TEC and REC dive center in Negombo, Trincoomalee and in Batticaloa, Sri Lanka. 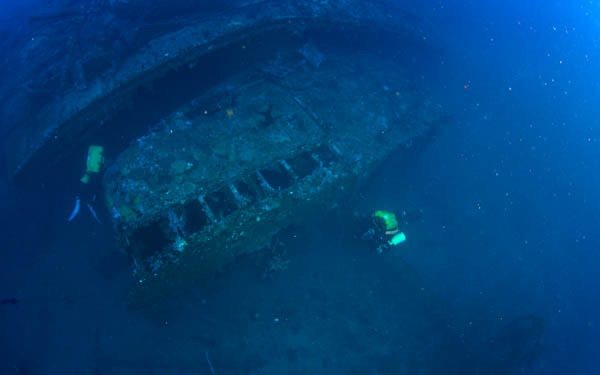 Since 2002 we have 950 tec dives on the wreck Hermes with approx. 150 dives per year. The aircraft carrier HMS Hermes set sail from Trincomalee harbour on 09/04/1942 on a mission. A Japanese invasion was impending. About 70 carrier borne Japanese bombers had taken off from 3 Japanese carriers which had entered Bay of Bengal the week before attacked the Trincomalee harbour end other allied naval assets. The Japanese air fleet managed to sink this carrier and other destroyers during the attack. They attacked the Trincomalee harbour and the oil tank as well. The carrier is supposed to have got about 40 direct hits and sank within 10 minutes. From the complement of HMS Hermes 19 officers including the captain (R. J. Onslaw) of the ship and 278 ratings lost their lives. About 400 were rescued by a Hospital ship, Two or three days later three heavily decomposed bodies were found on the beach near the Batticaloa light house. Two of the bodies had the name tags and one was without a name tag. 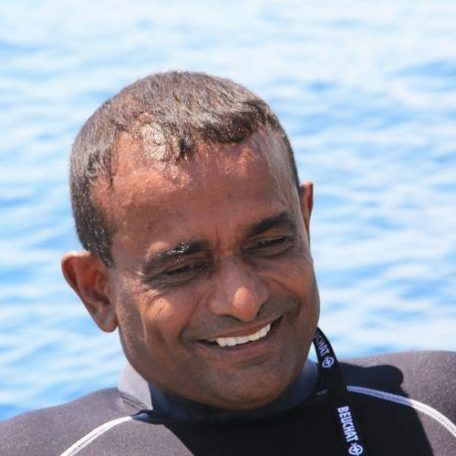 The photographer who managed to save his life visited the site along with his son on board a Sri Lankan naval vessel. The vessel midshipmen Capt. Edward Jayawardana had entered these details in his journal. Subsequently the son of the photographer wrote in a journal of the ill-fated carrier taking the notes his father made. He also revisited Sri Lanka along with his father’s ashes to dump it over the shipwreck to fulfill his father’s last wish. Incidentally Capt. Edward Jayawardana was again tasked to carry out this mission. These incidents are appended in the next edition of the journal of HMS Hermes. I clarified the details obtained from the Internet regarding the positions from Capt. Edward Jayawardana. I was determined to visit this wreckage and made elaborate plans since this wreckage has a historic value. The mission was quite dangerous and life threatening as the wreckage was supposed to be lying at a depth of 60 meters according to the information. The PADI recreational dive planner limits its dives only up to 42 meters. The non-decompression limit is 9 minutes at this depth and any stay beyond that requires decompression stop starting at 9 – 12 meters. Depending on the length of stay. The divers air consumption at this depth is normally very high due to high surrounding pressure which is about six times more than the surface. In my more than 2400 log dives, I had passed 40 meters about 45 times. Hence I was confident enough that I would not encounter any problems such as Nitrogen Narcosis, since during these dives I managed without any difficulties. Nitrogen Narcosis is the diver getting a feeling of intoxication, false safety, security and non responsiveness for buddy’s signals etc. due to the excess quantity of nitrogen in the blood stream. On 14/04/02 my buddy and myself arrived at Batticaloa planning to dive next day. We managed to find a boat to transport us to the site. The boatmen were not familiar with the site since they haven’t fished in that area for many years. After a 45 minutes journey using the global positioning system we arrived at the approximate site. The echo sounder/ fish finder sounded a depth of 48 meters. I got the boatmen to shift the boat forward and backward and recorded the depth on both sides which was around 60 meters and laterally 48 meters. The position matched the details of Capt. Edward Jayawardana. We got the boatman to anchor, after determining that the boat was steady on anchor, we dropped the two additional tanks fitted with an extra primary and secondary air sources to a depth of 15 meters. Thereafter we got into our diving equipment carried out thorough functional checks and rolled over the boat to the deep sea. We directly swam to the anchor rope and started our descent. In the whole world there are only two wreckage of aircraft carriers for recreational divers to see. This is certainly one of them and the other is supposed to be the USS Saratoga. 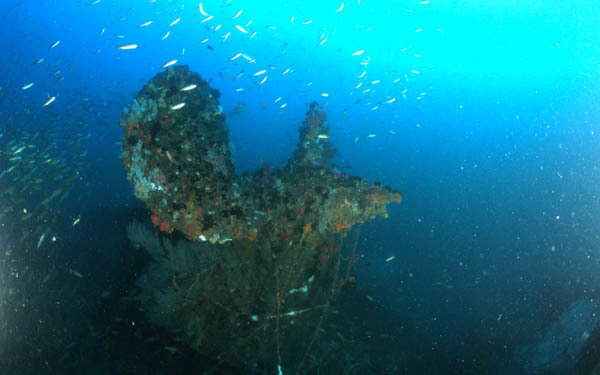 For more than three decades a dive to this historic wreckage was impossible due to the security situation. Now it has changed. 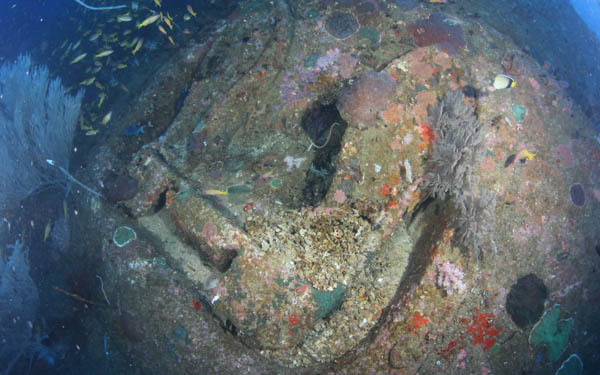 An adventure technical dive to this historic wreckage has become major tourist attraction. Now the exact waypoint is marked in my instruments and this will enable me to reach the site with pinpoint accuracy. The Australain destroyer “Vampire” which lost nine men is yet to be found. The aircraft carriers used by the Japanese force for these battles are supposed to have used by them to attack the Pearl Harbour as well.